This is our 3rd cooker hood in 9 years and it's by far the best yet. Powerful and solid chunky buttons and a good light. Very happy with it. 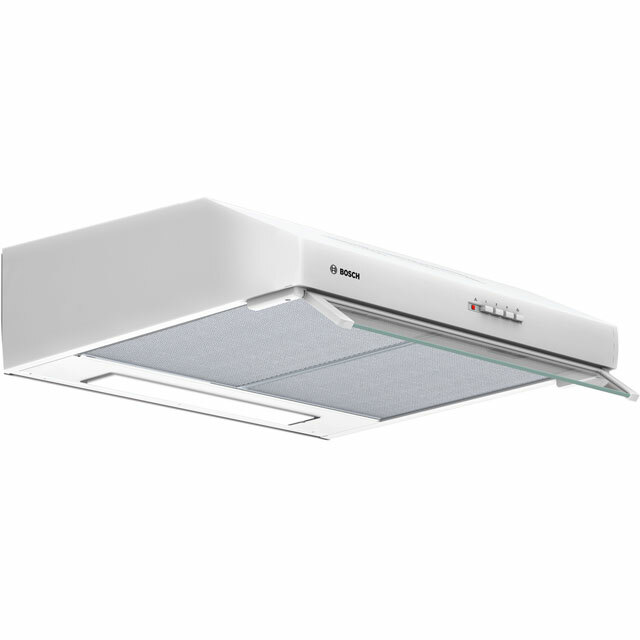 Bosch Serie 4 DUL63CC20B 60 cm Canopy Cooker Hood - White - D Rated Good looking, good value (considering the brand) cooker hood. Easy to fit. As some other reviewers have said on full speed it is noisy though. This cooker hood not only looks good, it is easy to fit with the template provided. Usual Bosch high quality components make it feel like a more expensive product so it is definitely worth the money we paid for it. I bought this particular cooker hood because of the Bosch reputation for quality and this particular one's capacity for clearing the air, up to 260 m³/hour as my kitchen steamed up very quickly and the windows were running. Well I am not disappointed as it certainly shifts the steam and my windows are now dry. It is a bit noisy particularly on setting 3 but I can't imagine a quiet one shifting this much steam and I would sooner have efficiency over quietness every time. An added bonus is being able to put the two metal filters in the dishwasher. The front controls are simple to use, have a solid feel to them and the lighting is very good. This unit looks good and it extracts well. It is a little noisy. It looks stylish, built well and is easy to use but it is very noisy when its in setting 2 and 3. This does not come with any carbon filter which is a slight let down due to you not have a choice to buy as an added feature when buying online.